Heat oven to 350°F. Spray 36 nonstick or silicone mini muffin cups with cooking spray. Unroll both pie crusts. Using 2 1/2-inch round cutter cutter, cut out about 36 rounds, re-rolling pastry as necessary. Press 1 round into each muffin cup. Place 1/4 teaspoon peanut butter in each cup. Cut each cookie dough square into 3 pieces. Roll each piece into a ball; press to flatten into disk. Place 1 disk in each cup over peanut butter. Bake 12 to 14 minutes or until crusts are golden brown and thoroughly baked. Remove from oven; cool in cups 5 minutes. Press 1 orange candy melt flat side up on top of each pie. 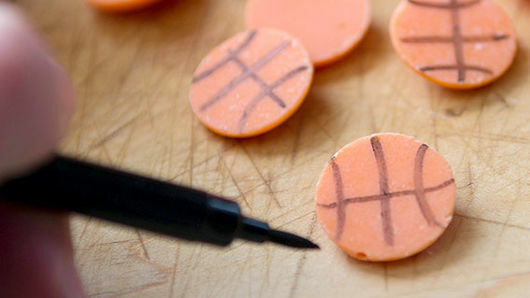 Cool candy completely; then draw basketball marks on each candy with edible color pen. Cool pies completely, about 15 minutes. 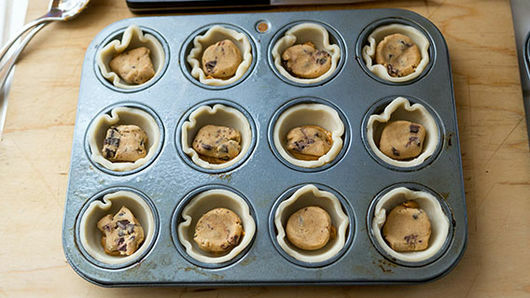 Using sharp knife to loosen around edges, remove cookie pies from muffin cups. 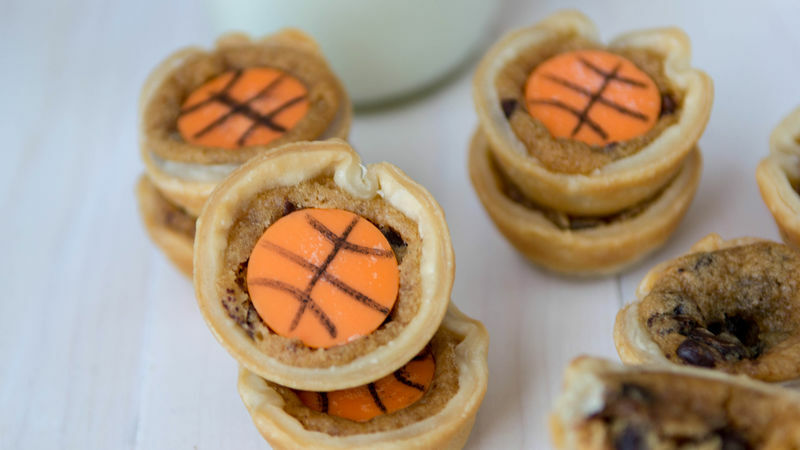 Skip the peanut butter, or substitute cookie butter or hazelnut spread for a new flavor twist! Skip the basketball decoration and frost with chocolate icing and sprinkles for a birthday treat.